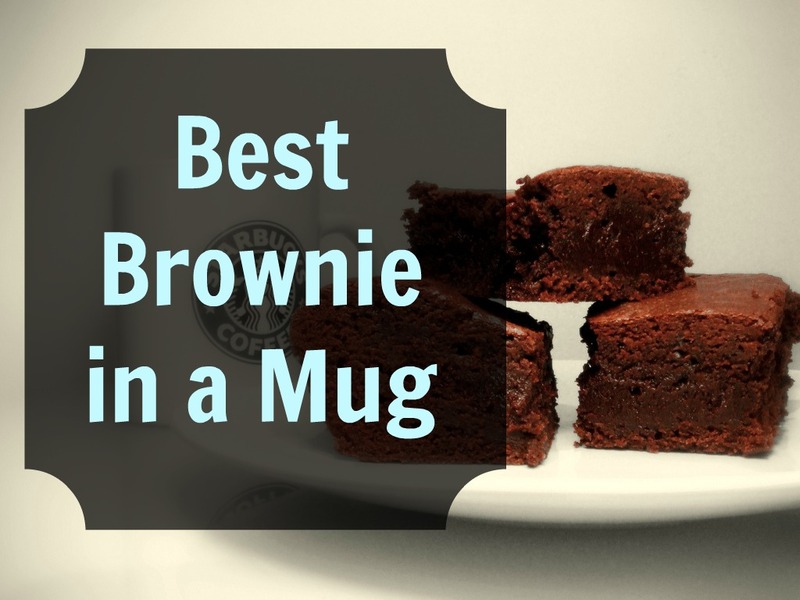 This is the BEST Brownie you can make in a mug! I must confess, I love chocolate. Before this recipe, I would grab a few tablespoons of Enjoy Life Semi-Sweet Chocolate Chips (affiliate link). These were not the perfect solution although they had great ingredients, they were still filled with sugar. This brownie in a mug is my go to chocolate craving killer. You just mix this brownie up in one minute and microwave… then sit down and enjoy the hot, fresh Brownie in a mug! Sometimes you just need chocolate. Some days you just need a brownie! 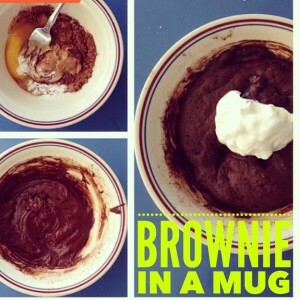 Who wants to bake brownies for 20 minutes when you can enjoy this brownie cake in a mug in less than 2? Adam and I love to enjoy this treat as an S (Satisfying) Trim Healthy Mama dessert once the girls go to sleep at night. It is our little date escape (in a mug). We top it with some stevia sweetened Greek yogurt for an extra special addition. Pour yourself a cup of coffee to go with it, and you have yourself a little escape during nap time. You can enjoy this as an afternoon snack or dessert. With lots of protein and quality fats, it is good for an afternoon slump to pick up your energy without pouring loads of sugar into your system like a power bar. These brownies in a mug were my staple during my pregnancy. I had at least one every day as an afternoon snack. This was a good pregnancy snack because it had ample amounts of protein and was low in carbs. These also have some great ingredients full of vitamins and nutrients that keep you strong and healthy. I also want to try this recipe in my waffle iron. I haven’t done it yet… but I think it would be a neat variation that you could top with Greek yogurt and berries…. Yummy! Then you could even enjoy it as a nice filling breakfast. Special Notes: If you don’t have peanut flour, then just use 2 tablespoons of peanut butter or almond butter and delete the extra Tablespoon of water and coconut oil. Also one reader really liked this recipe adding a little Greek Yogurt in with the batter – Try it and see if you like it that way too. Don’t over cook this brownie – then it will be too dry. I prefer it to be a little gooey on top. Mix all ingredients well in a mug. Microwave for 45 sec to 1 minute depending on how done you like it. Or Bake at 350 degrees for 10 minutes. Make sure not to over cook it! I like mine a little gooey still on top. I top mine with stevia sweetened Greek yogurt. Could sub 2 Tablespoons of a nut butter (I used almond butter) in place of peanut flour and leave out water and coconut oil. Also for a more fudge like consistency you can add a little bit of Greek yogurt in the batter. I only cook mine for 45 seconds and the top is still wet and gooey in a coffee mug. P.S. Hey Healthy Mama! Have you ever thought about using your passion for health and wellness to grow a side income? If that’s you, Click here to learn more. Looks so yummy! I think I’ll be trying this for my afternoon snack today. I’ll join you on that! I just made some Trimaccino Hot chocolate this morning… I love Trim Healthy Mama recipes so much! When you say, ‘the best’ and ‘brownie’ in the same sentence that means I HAVE to try it! 🙂 Thank you for linking up at Trim Healthy Tuesday! Haha. I love this recipe! It is fudgy when you only microwave for 45 sec. I always eat mine with vanilla nut flavored Greek yogurt! My husband loves this treat so much too. Love this healthy version! Perfect after all the junk I have eaten after the Holidays. I love your site! Too cute! Will your link up be on your home page? I tried this recipe with a little extra Truvia, as I like my sweets extra sweet. I cooked it for 1 minute in the microwave. It tasted very bland, so I added some thm skinny ice cream on top. It still was very dry and flavorless. I have tried several different thm choc. muffin in a mug type recipes and have yet to find a good one. The search continues. Oh no! I’m sorry. You can try to add in more extract or try a different flavor like caramel if you like. I really like the dark chocolate flavor. I also always eat it with yogurt on top. I don’t microwave mine very long. Maybe 45 seconds. I like the top to still be a little moist. When I was pregnant, I ate this with low carb ice cream on top and it was so perfect. This sounds AWESOME!!! I will definitely try it today! Just curious, did you lose any weight on plan? I have lost about 5-7 pounds since starting after my initial post partum weight loss. I’m about 125 pounds now. The biggest change for me is how I feel. I also love the freedom of the eating plan. I lost about 5-7 pound on the plan. I am about 125 right now at 7 months post partum. I think the biggest part for me is how I feel. I really was having a hard time controlling my blood sugar and this is the perfect plan for me. I have more energy and no more sugar crashes. I was eating paleo before… but I was struggling with cravings for sugar still. I would bake whole food desserts and it would still do a work on my blood sugar. With trim healthy mama, you are okay to enjoy sweets using stevia to sweeten (which I love). I also love the freedom of the eating plan. I find I am more creative in the kitchen with finding health recipes. Wow, glad to hear the stories of other fellow Trim Healthy Mamas! I lost 25 lbs. following Trim Healthy Mama, very happy with it! I really love the plan! I keep telling all my friends about it. It is one book that can help anyone who is ready for a change. Wow, good for you! I lost 25 lbs. following Trim Healthy Mama, very happy with it! That’s what I like to hear! I am so glad you liked it. Yes! it will – I am pretty sure it is 350 degrees for around 10 minutes. Whoa. I just made this – amazing! I’ve been craving a brownie and this hit the spot. I tossed a few sugar-free chocolate chips on there and gave it a shot of whipped cream. Sooo good. 😀 Thanks! Thank you so much for leaving me a message! I love this Brownie substitute… I have a sweet tooth and I love chocolate… and something you can enjoy hot and fresh whenever you want – I’m sold! So glad you love it too! Looking forward to making these! I only have the THM stevia and KAL stevia. Any thoughts on how to measure? Would it be the same amount as the NuNaturals? This is amazing!!! I did engery egg replacer instead of egg – the almond butter in place of peanut flour, honey, and nuked for 5 minutes. Best thing I’ve had in months!!!!!!!!!!! Haha! It is yummy : ) Some days I would eat it 2 times! I was on a super low carb diet during my pregnancies. I didn’t gain but 25-30 pounds with both pregnancies and lost all within 2 weeks or so. When I’m pregnant I gain 30-50 pounds but always (this is #12) only lose 10 pounds. I then get to work the rest off. Not nice. I’m hoping eating this way will help this time around! These are amazing! I would highly recommend this recipe to anyone cutting out grains and sugar. For me, it turned out more like a super moist cupcake. I omitted the peanut flour, oil, and water, and put in 2 T. of peanut butter and 2 T. of sour cream. I put it in the microwave for 40 seconds and when I pulled it out the top was still gooey, the bottom was super moist. Perfect! Also, I mixed 1 T. of softened butter with 1 T. of softened full-fat cream cheese, 2 tsp of Swerve powdered sweetener, and 1 Tsp of unsweetened cocoa powder for a delicious chocolate cream cheese frosting to put on top. HAVE MERCY this brownie/cupcake was utter perfection. I may or may not have shed tears of joy while eating this 😉 It was super easy for me to play with the sweetness, and I probably added a full tsp of stevia before it was sweet enough for me btw. Next time, I might add in a T. of melted butter for a more fudge-like consistency. Thank you SO much for a recipe I will pull out time and time again! 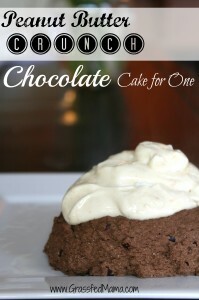 Just found this recipe, so I thought I’d give it a whirl today! Thumbs up from myself AND my ten year old 🙂 I really dislike Stevia, so we used agave in it – which brought the carb and calorie count up, obviously, but it was delish. It begs for a glass of milk!!! OH MY WORD! I made this for breakfast today. Really nice. I did add the GY and loved the flavour and texture. (i attempted to make my own GY a few days ago so it was fun to use it). Thanks for the share. I’ll be keeping this one on the menu. Thank you so much for letting me know : ) I am actually eating it right now too, haha. One of my favorites!! Just tried this with my breakfast this morning and followed exactly (except I did add some xylitol to sweeten even more). Topped with whipped cream and cinnamon! Very rich chocolate flavor! Very satisfying. Will be making this again and tweaking even more. And the 45 seconds was perfect. I loved the wet inside!! Oh those are some great tips!! Thanks for sharing! Can I make these without a microwave as we do not own one? How long would I cook it for do you think? Looking forward to giving it a go. Love your recipes. My son and made it tonight for the first time. We used the new Jif peanut powder, since that is all I had. I used the 1 1/2 Tbsp yogurt and my son did not. We like to try it different ways to see the difference. I cooked mine 1 min 20 sec….based on previous experience with other recipes. Mine turned out very dense and moist. I really liked it, but think I needed more sweetner. I just used a walmart stevia and should have used Truvia. He cooked his 1 minute and it overflowed everywhere…lol…and was still a little gooey. He liked his but said it also needed a little more sweetner. I agree. So next time…I think I will reduce the yogurt a little and up the sweetner. Also will use a good quality one for baking. Thank you for the recipe! My son is loving THM dessert testing! I have a peanut allergy. Would the THM baking blend sub in even for the peanut flour on this? Desperately searching for a delicious brownie mim! I honestly am not sure! But I bet you can play around and make it work for sure. This looks sooo good!!! I really want to make this soon, thought I can’t have nuts (at all). Do you know of a replace for the peanut flour? Definitely the best. I use Pyure “organic stevia” at the amount you suggest, and butter rather than coconut oil, and it’s perfect at 45 seconds – I’ve tried other chocolate mug cakes but this has by far the best texture. I confess to adding a heaping teaspoon of PB to the center after mixing it for surprise bits of extra-gooey, peanut buttery goodness. No matter what sweets pop up on Pinterest – no matter what the kids are eating – is absolutely impossible to feel in any way deprived when this is your afternoon snack. That is something I love about THM; its actual diet information is not new (what is? ), but it’s geared toward the reality that diet problems in our culture are emotional as much as or more than matters of information or willpower. Desserts/snacks like this negate emotional hindrances to healthy eating. Outstanding! Thank you so much for sharing! YAY!!!! I’m so glad you love it!!! I know that I have learned that I like a little more bitter taste than some. I LOVE adding whipped topping too.